That little jar of unused dressing from before was sitting in the fridge, calling to me. With a fresh supply of romaine, and a hungry friend that adores Thai food, I decided to try again. I’d already eaten lunch, so I was making this just for my friend. 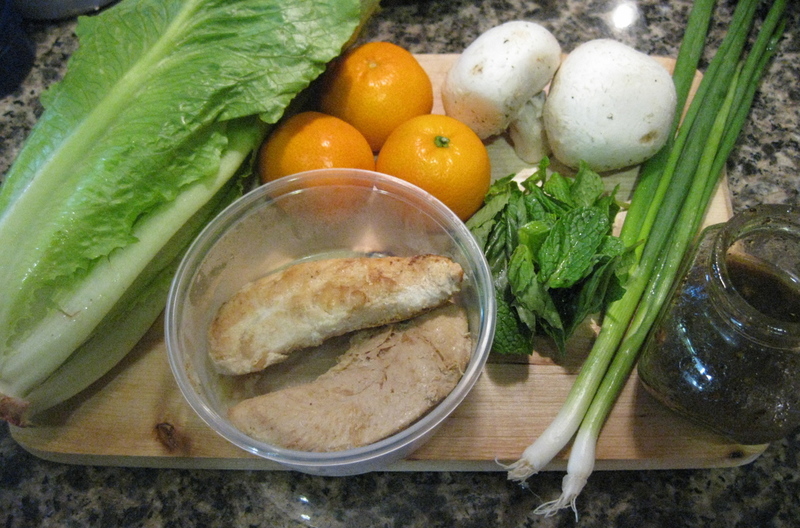 I pulled out the romaine and the mushrooms, and a lot of mandarins. I remembered how very delicious the mandarins were with the first batch (the one redeeming combination, actually) and I wanted to make sure at least one part of it worked. I also added an extra scallion to punch up the flavor. I would’ve put more basil in, and thai basil instead of regular basil, but sometimes I’ve just got to make do with the dregs of the fridge. The chicken tenderloins were leftover from a previous dinner, and were necessary to make it a meal for my hungry friend. I think it would work quite well as a side salad without the meat. The ingredients, ready to face the knife and dive into the bowl. 3 mandarins, peeled, sliced in half, and cut into eighths. 1 fistful of mint, sliced. 2 tsp thai black pepper sauce. 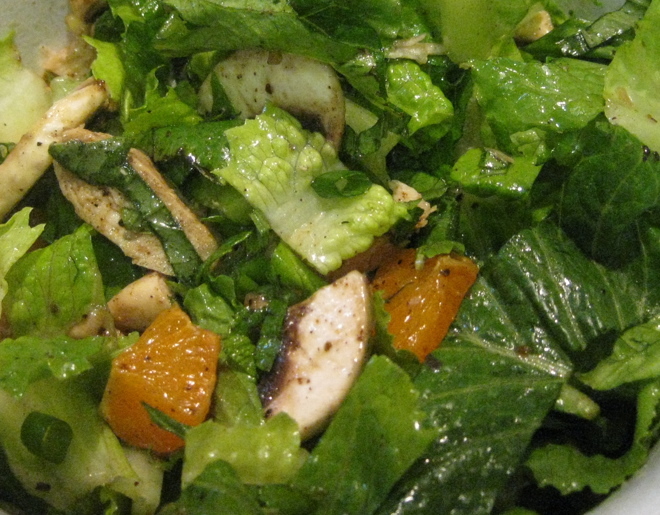 I chopped the lettuce, and layered it with herbs, mandarins, and veggies. Then I snipped the chicken into bite sized pieces with a pair of kitchen shears, and drizzled the dressing over it all before gently fork tossing it. I wasn’t sure there would be enough vinaigrette, but the powerful flavors really shone, and it was actually just right. Success! The romaine was perfect for this dressing. Crisp and crunchy, the mild flavor of the lettuce really let the vinaigrette shine. The mint added a delicious punch, and the mandarins were juicy and good. The chicken fit right in. My friend was pleased. Very pleased. Done. I think tofu would also work really well with this salad, since the vinaigrette has so much flavor. Grilled shrimp would also be very tasty. That’s easy for this one — just peel and section the mandarins instead of slicing them. You lose the bejeweled beauty, but you keep your lettuce crispy. The dressing stays in a small jar, and the salad goes in a large container, preferable glass or stainless steel, with enough space to easily fork-toss. 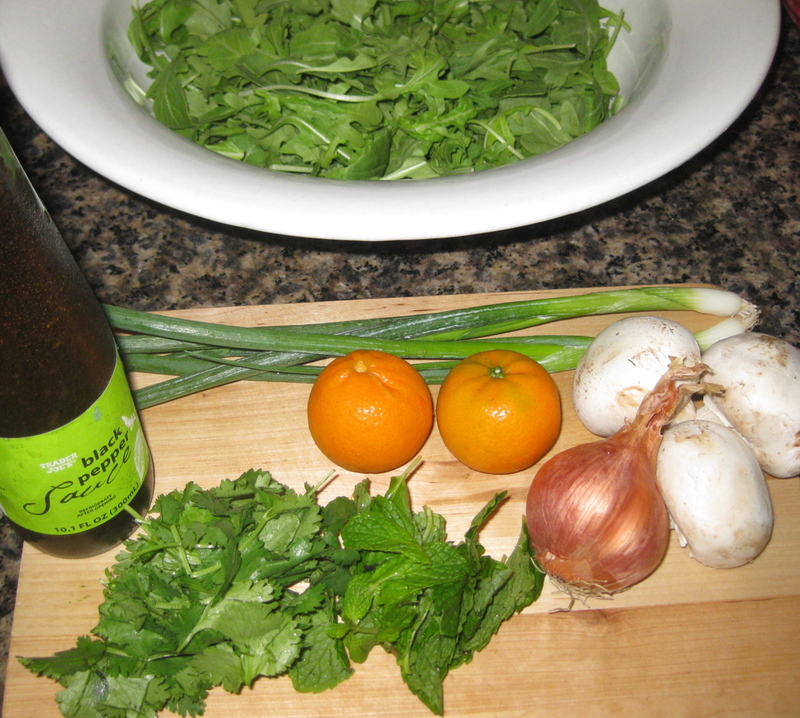 Here are the ingredients for the salad, ready to be taken apart and tossed together. After a long, hectic day, including several hours at the Lawrence Hall of Science, and a trip with all three kids to Trader Joe’s, I was exhausted. Dinner needed to be quick. The kids had packed our shopping cart with more frozen food than our freezer can hold, so we were definitely having a lovely bag of teriyaki chicken for dinner. I didn’t need to read the back of the package to know that I wanted the Trader Joe’s component to be a small part of my meal, so while I cooked rice I dug in the fridge for salad ideas. Being really experimental rarely works when I am super tired, but I keep trying anyway. That’s a warning. See if you can spot my mistakes. I pulled out a brand new bottle of Trader Joe’s Thai Black Pepper Sauce, thinking I could riff on the Asian theme and go fusion — Japanese teriyaki chicken and a Thai inspired salad. I tasted the sauce, and knew I needed some sweetness to balance the peppery savory flavors. So I grabbed a couple of mandarins, some scallions, and a few very large mushrooms. I debated over the romaine hearts and the arugula I had in the fridge. (I am very ready for a trip to a store other than Trader Joe’s — I need more interesting greens, NOW!) After a previous slimy Trader Joe’s arugula experience, I decided to save the romaine for later and use the wild greens while they were still fresh. Peppery arugula with the black pepper sauce sounded like a good match. 2 mandarins, peeled, sliced in half, and then sliced into eighths, taking care to avoid separating the sections, and instead to slice through the fruit and expose as much of the glistening orange as possible. I mixed up the dressing, adding more maple syrup than I usually use in order to balance out the spicy pepper sauce, and made the salad while the rice cooked, pausing long enough to microwave the teriyaki chicken and toss it in a bowl with it’s prepackaged sauce. The whole meal took as long to make as basmati rice takes to cook, and it was easy to stick the dirty dishes into the dishwasher along the way. Here is the finished salad, ready to serve. Did you spot the mistakes? I’ll break it down for you. The black pepper sauce salad did not, at all, work with the teriyaki chicken. Too much sweetness, and the flavors were just too different. Don’t get me wrong, we ate every bite, but it was jarring to have them side by side. Not ideal. 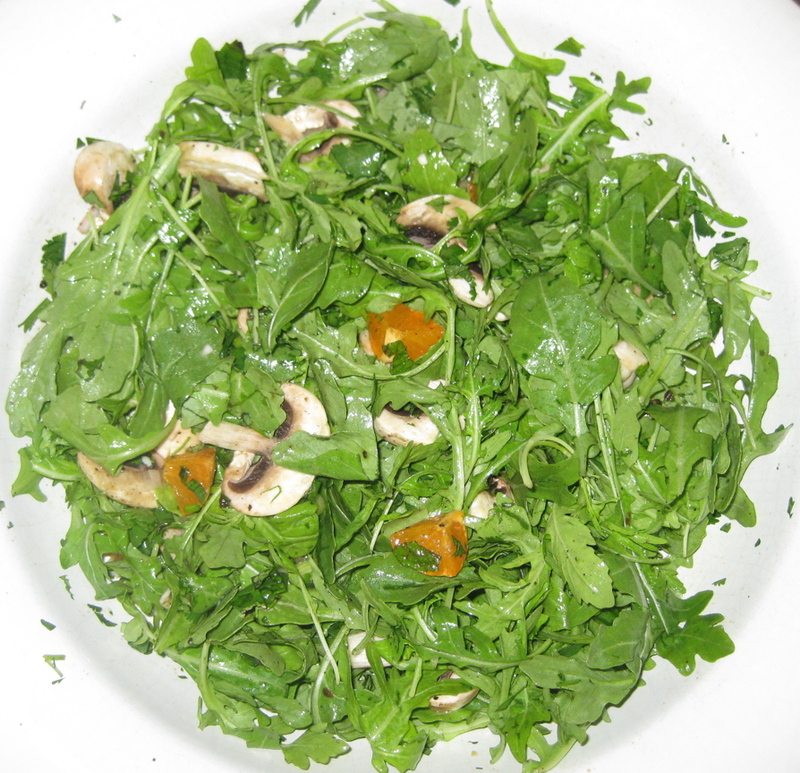 The vinaigrette seemed like a winner, but not with the arugula. The combination was ridiculously peppery. There wasn’t enough variety in the salad, though the mandarin bites did redeem it a bit. If the flavor of the chicken melded with the dressing, it would’ve been much more palatable, since the chicken is sweet enough to be classified as candy, at least according to my mouth. But I couldn’t combine the two. I ate this dinner like I did as a kid… In batches, trying not to let my food touch. I used just over half of the dressing, so I decided this will definitely be a do-over in a few days, with romaine or a milder, crunchier lettuce. 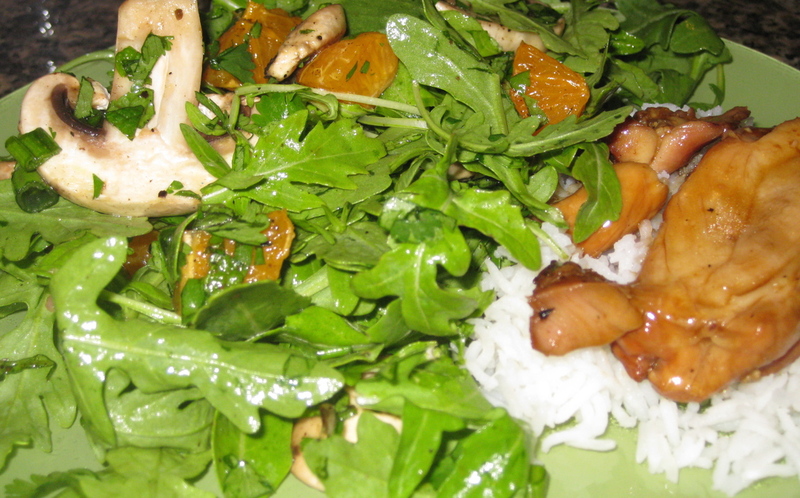 The dressing had a lot of promise, especially with the mandarins, but it did not work with the arugula or the teriyaki chicken. It looks prettier on the plate than it tasted to the tongue. Sometimes, food is just food, and you eat it for the nutrients. That’s what this meal was. At least we ate a lot of leafy greens with our prefab chicken. I’ll do that later in the week, I promise. My plan is romaine lettuce, more mandarin, and chicken sliced over the top. We’ll see how that goes. The mandarins need to be peeled and sectioned instead of sliced, so that their juices don’t wilt the lettuce. Otherwise, it works as described. Except for all the problems I’ve already outlined.So don’t pack this to go. Play with some of the ideas, and pack your own invention instead.